Running for a school office is a tough climb. It takes a lot of hard work and perseverance to campaign for a leadership role. But don’t wait to demonstrate your leadership potential until after the race. 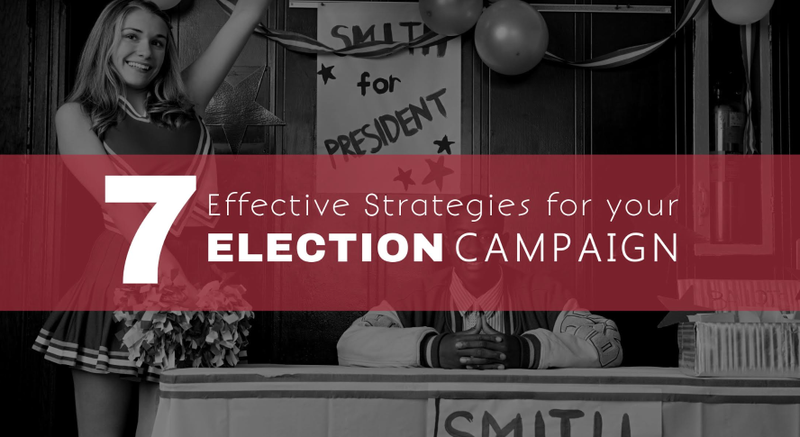 How you run your campaign can not only get you into office, but can illustrate your leadership skills along the campaign trail. It takes a strong leader to enlist supporters and persuade voters to place their trust in you over the competition. You’re already demonstrating a key component of leadership, initiative, by choosing to run and checking out this blog. Read on for tips that will help you make the climb, and out distance your competition to the top. Regardless of the office you’re interested in, you need to have a reason. Why this particular club or council? Why this specific position? Why now? What is the impact that you want to create and for whom? Your reason for running will guide you in your campaign as well as help you stay motivated when the climb gets steep. If your goal is the almighty presidency but you’ve not held an office before, start your climb on a lower (or even lowest) rung. To run successfully you need to gain solid experience in the group or council you eventual want to command. Serving in a lower office will provide you with the experience necessary to build credibility, as well as help you develop a group of supporters that want to see you get elected. No one gets elected alone. There is a reason that politicians go on campaign bus tours and it’s not because they like the rest-stop food. It’s all about meeting people and building connections. Get to know the people in the group(s) that will be voting for your position. Invite those that seem most interested to help with your campaign. The good news is that when you connect with someone, their connections have connections, who have connections … you get the idea. If you reach out, build relationships and do it right, you and your campaign platform can literally go viral. Doing it right starts with having a solid a platform. Remember your reason for running? It’s not just about holding an office, it’s about getting something done that you believe others want done as well. Does your club/council need a new soccer scoreboard, host a robotics tournament, or bring in new speakers on human rights? What problems do you want to solve in the position? Remember, campaign only on issues that your office has the power to influence. If you promise to shorten the school day you either won’t get elected, or if you do, you will ultimately fall short of keeping your campaign promise. Your platform has to be solid and potentially achievable before you can get the word out. Running a campaign in a world dominated by Snapchat and Instagram, means you need a slogan that can capture your voters’ attention in just a few words. It doesn’t have to be complicated, but it should be memorable so voters will associate it with your campaign. Whether you borrow a popular slogan like Nike’s Just Do It!, Vote for Maya, or something more focused, like, Results & Resolve, Vote Ryan, be consistent. Use free social media templates to post on social media consistently and reinforce the slogan in the minds of your audience. Make sure your slogan also appears on everything you hang up at school or handout to voters. 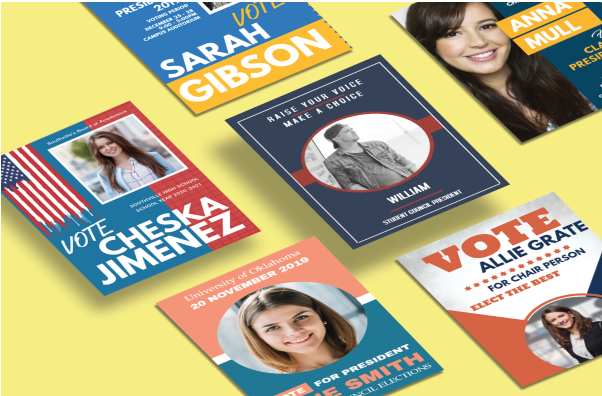 Posters and flyers are a highly effective way to spread the word about your run for office because they visually put your campaign front and center. First make sure to find out your school’s policies on the what, where and when for using printed campaign materials. Continue the hype by printing your graphics on stickers to be handed out and worn by your supporters. And don’t forget to include your slogan! Consistency and frequency breed familiarity. The more familiar you are to the voters, the more likely they are to listen to what you have to say. Your campaign platform should drive your speech, in which you tell, then sell. Tell your voters what you plan to achieve in office and why it should be important to them. Then sell your voters on why you are the best person to get the job done. Finally, remind your voters how achieving your goals will benefit them and others. Persuasive tip: Begin your speech by stating something on which you and the voters agree. This instantly deepens the connections you’ve built, and opens voters’ minds to hearing what you have to say. Continue to hold their attention by being upbeat, positive and sincere. Running for office is not easy. But just because something is hard doesn’t mean it shouldn’t be done and it can’t be fun. Stay focused on your goals, keep your connections and embrace what you learn from the experience. Above all be humble and grateful when you win, gracious if you lose, and do both with dignity. Happy campaigning!